I love potato salad in the summer, but wanted to make a healthier version that still had summer flavor. So, I used sweet potatoes instead of white potatoes and a vinegar based dressing instead of mayo. I was really happy with how this turned out! I’ll definitely make it again. Peel the sweet potatoes. Cut them lengthwise into quarters or fifths. Then cut into bite sized pieces. Roast the sweet potato pieces with a light sprinkling of salt and pepper at 400 degrees for about 20 minutes, until the sweets are tender when pierced with a fork (but not mushy). Slice the bacon into small bite sized pieces. Saute the bacon pieces on medium heat until crispy. 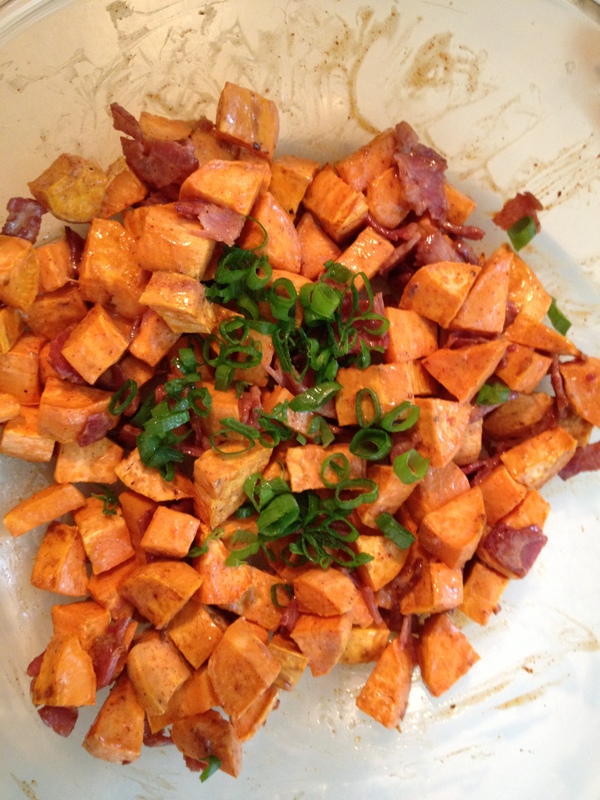 In a large bowl, combine the sweet potatoes and bacon. Make the dressing by adding the honey mustard, white wine vinegar, olive oil, lemon juice, lemon rind, paprika, and coriander to a shaker or bowl. Shake or stir to combine. Pour the dressing over the potatoes and bacon. Toss lightly to coat. Let cool in the fridge for a couple hours.